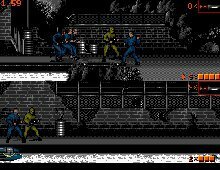 A significant update to Infogrames' earlier classic Hostages, Alcatraz is an infiltration operation set inside one of the world's most famous prisons. As a SEAL marine, your task is ultimately to find and arrest a Colombian drug lord Tierrez who is using Alcatraz as a base for his drug ring. There are three stages to accomplish this goal, all of which are outlined in the your mission briefing. First, you must penetrate the prison to find the papers that will incriminate Tierrez. Next, you must find the target room to plant a timb bomb, and finally infiltrate the third, heavily guarded building to make the arrest. Like many other Infogrames action games, Alcatraz features smooth VGA graphics, and alternating perspectives to keep things fresh. The side-scrolling view when you are outside some building changes to first-person mode once you are inside. At your disposal are many different weapons, both traditional and high-tech, including flamethrowers, machine guns, bombs and other destructive close combat weapons, each giving appropriate damage and death throes. In two-player mode, the game is played in a horizontal split-screen, with each half of the screen devoted to each player. With smooth animation, a combination of stealth and action, and non-repetitive enemies, Alcatraz is a pleasant little platform game. Hostages fans may be disappointed at the lack of dramatic close-ups or strategic elements in the game, but it has a lot to offer otherwise. Recommended!